Sofocle empowers technology innovation and value creation leveraging the power of Blockchain Technology. We build products and solutions for various industries notably Finance, Insurance, Healthcare, Manufacturing and Logistics. Looking for a partner for your innovative idea? experts at Sofocle can help you. We help you identify the use cases suitable for Blockchain applications, relevant to your organization and implement them using our expert team of Blockchain developers. 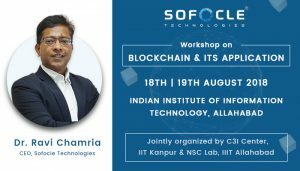 We are one of the early adopters of the blockchain technology in India and we believe in executing our learning and staying ahead in the graph. As a result, we are growing continuously by implementing successful POCs, client engagements and delivering reliable solutions to our partners. We are the winner of the Fintech Valley Blockchain Startup Challenge 2017- Vizag, sponsored by government of A.P, India. Our achievements are acclaimed in the blockchain ecosystem and we are one of the prominent attendees and speakers in many technology based events and conferences.